Provide beautiful butterflies a cozy and colorful home with the Heartwood Flutterbye House and Pole with Turquoise Roof. Architectural detailing throughout this shelter makes it a striking addition to your landscaping, while its vivid color scheme lends a coastal hint to the area. An antique white, square body creates a roomy home, with beaded edge drop siding mimicking seaside houses. A hipped roof tops this shelter, its bold turquoise color bringing attention to your garden in moments, while a copper roof cap and trim on each edge complete the piece. Three vertical entry slots on the front of the unit mimic crevices butterflies often use for protection from the elements, and also contrast the horizontal beaded edge for a bit of style. Two copper butterfly appliqués on the item help draw the attention of these lovely insects, and the included, 30" tall stake allows you to place this piece at just the right display height in your garden. Crafted from durable cypress, the home will look fantastic in your backyard for several seasons, and a copper cleanout panel on the back makes seasonal maintenance simple. 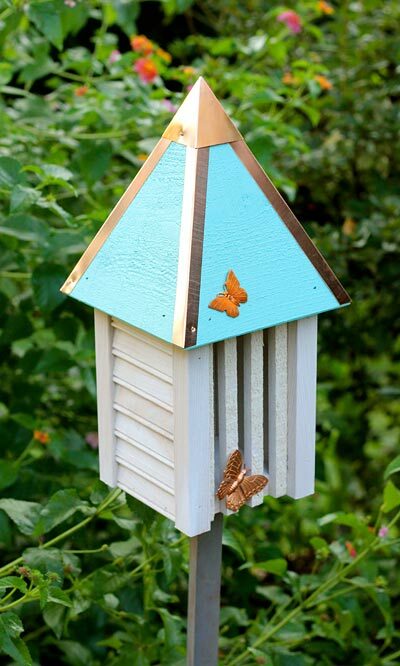 Enjoy butterflies visiting your garden and provide them shelter in this Flutterbye House and Pole with Turquoise Roof. Made in the USA.